When consulting on site layouts and page layouts there is often a balancing act with regard to what a site owner wants to see and what will give the opportunity for the highest level of success. Users of the web have become conditioned on where to focus and what to expect. If you don’t deliver what they expect within a short period of time, your user will become detached and bounce. There are many site owners/designers who will use a beautiful looking layout from one of the many template sites (boxedart.com, templatemonster.com, etc.). Though many of these designs are beautiful, many are designed to be visually appealing and don’t take usability into account. There are many template designs with tall header graphics that don’t allow much more than a couple of inches at the bottom of the screen for your valuable content and or navigation. There are also factors to consider such as ad blindness. If you design your page in a way that your call to action(s) resemble advertising, your message will be lost. Combine that with a huge header garphic and your visitor is gone before considering your message, service, or product. The Gateway website (below) is a great example of ad blindness. 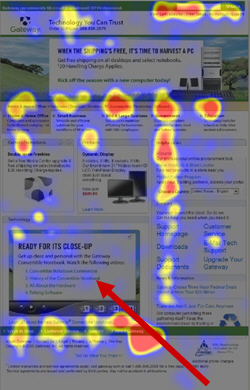 Take a look at the hot spots in this heat map (the hot spots are the focus points of the users’ eyes). The red arrow demonstrates the lack of focus that was paid toward the ‘featured item’. The designer may have felt that this would become a focus, however, the exact opposite took place. Ad blindness kept this feature from gaining any attention. 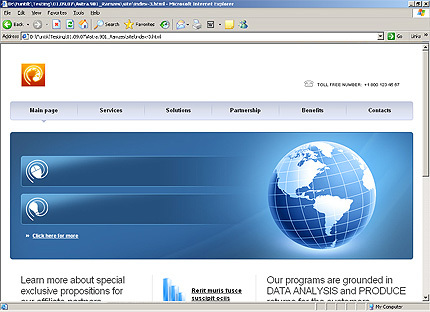 When designing a site/page, be sure to take usability into account. Don’t let your featured items be misconstrued as advertising and subject to blindness. Consider writing styles that will provide users with snippets of information. There is a particular method for writing on the web. Short paragraphs, bulleted lists, interjected images, etc. You need to provide your message to your user in short order or your user will be gone. All of the marketing efforts to deliver that visitor are lost if your page cannot convert.